A couple of weeks ago, I went on a Focus On: Graffiti photo walk with The Photo School and I got to meet the lovely Melizza from Sifting Through... Expat Edition. I’ve been to a couple of events hosted by The Photo School and each one has impressed me greatly. 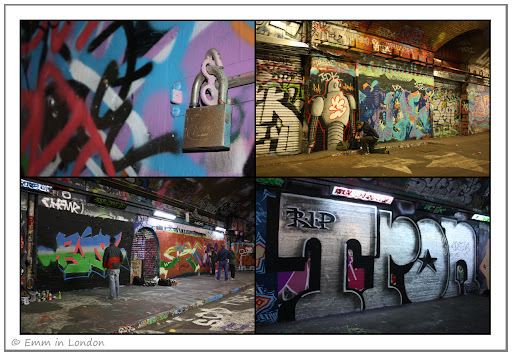 On this day, for the price of just £10, organiser Natalie Clarke guided us through the Leake Street Graffiti Tunnel near Waterloo and the Southbank skate park and gave us all excellent advice on camera settings, lighting and composition.. It goes without saying that I was in my element. I know that many people wonder about my fascination with derelict buildings, skyscrapers, graffiti and other hallmarks of urban development but to me, this is just beautiful. 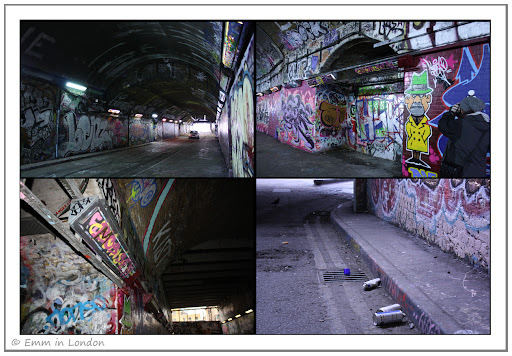 It is incredibly hard to take photographs of graffiti and indeed, it was far more difficult than I expected it to be. Unless you get the angles right, your photo will resemble exactly what you are capturing: some paint on a two dimensional wall. Added to that, there is no natural light in the tunnel and instead you have unnatural strip lighting. If I could go back in time, I would go back to late-2008 and tell myself that one day, I would be able to take photos in fluorescent and tungsten lighting. I remember being so disappointed with indoor photographs in the past! I took a ridiculous amount of photos that day and only chose my very favourite ones for this post. Strangely enough, the photo above was the first I tried to capture of this particular scene. I tried several more and even came back later on and then decided in the end that this first one was the best. I experimented a lot with black and white photography on that day and once again, I realised that it is not as simple as it seems. My uncle used to do a lot of monochrome photography in the 70s and 80s and I would love to experiment with it some more. We met some street artists and they absolutely challenged what I thought I knew about graffiti artists. They were older than I expected and in fact, the one I chatted to was the same age as me. He said that he had not done graffiti for about eighteen years but was getting back into it. He said he liked painting in the tunnel because you could take your time and that they would be there for most of that day. He remarked at how different this was to rushing like they had to when they were painting the sides of trains or buildings. 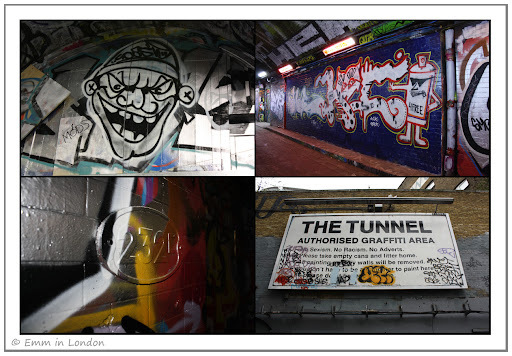 The world famous Banksy is said to have started the Leake Street Graffiti Tunnel back in 2008 as part of his Cans Festival. The face of the tunnel is forever changing and I imagine that it is the kind of venue that I will want to visit again and again. Look out for a guest post on the fabulous Stik later in the week! 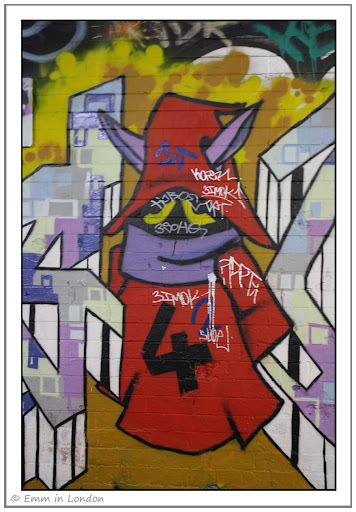 wow ... thanks for sharing this "authorized" look at this graffiti/banksy/tagger underworld. very interesting, Emm. Hi Emm - sounds like you had fun. I'm also experimenting with black and white photography and like you say it isn't as easy as you'd think. Wow, so much to love here!! First, I imagine you are right about photographing graffiti - there is such a hugeness, a fluidness to it that would be hard to capture. Yet you have, beautifully. I love the close up images, especially the eye. I am also amazed at your meeting with the artist and that one of the things he loves is taking his time. I've always imagined a quickness to it, dashing out the art and trying to not get caught. such a great view into this art form, thanks! The tunnel sure is an amazing place. It may be an old, dark, murky stinking tunnel, but there is so much life there. I couldn't believe it when I discovered it, I was like WTF is this place. 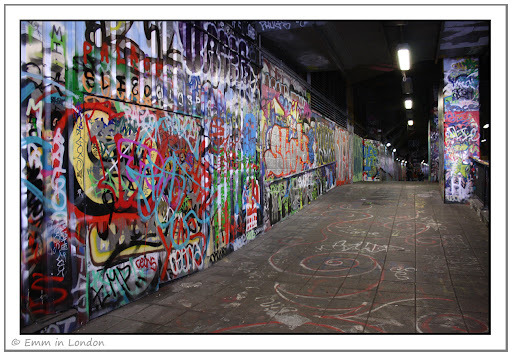 You will find everything there that is good about graffiti and everything that is bad! It would have been a buzz to meet old school graffiti artists, nowadays there are too many art school students and twats with tight jeans on doing it, because it has become cool. I must admit, there is a lot of talent in graffiti. Enjoyable to photo-shoot with others. Thanks so much for telling me about the Graffiti walk. It was a great experience and I am not sure I would have ever found out about the tunnel. 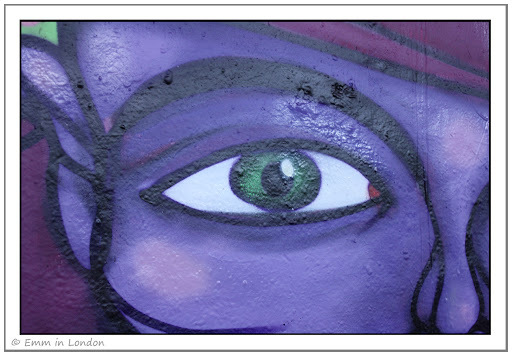 And I *love* that shot of the purple eye. Almost feel as if it were the real thing looking back at me. You should see the graffiti in Brazil. It is beautiful! i love graffiti art. some of the artists can be pretty talented and creative. the ones found in Athens are amazingly stunning too. 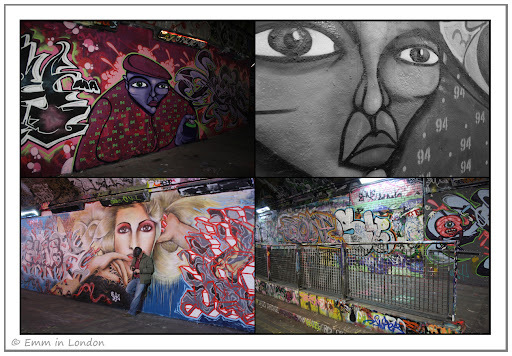 I never thought I'd hear myself saying this about graffiti, but those pictures really are absolutely stunning! 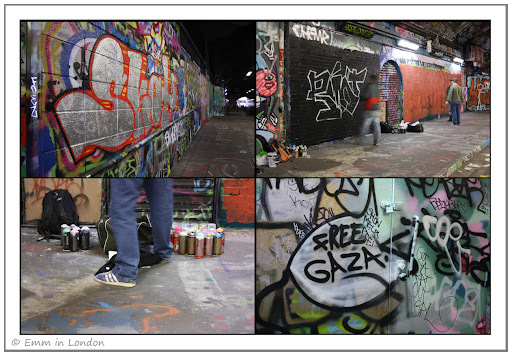 Great photos and graffiti! I love that one of the artists said he liked painting in the tunnel because his work would be there "for most of the day". WOW. Seems a bit heartbreaking to have to cover someone else's art so quickly. 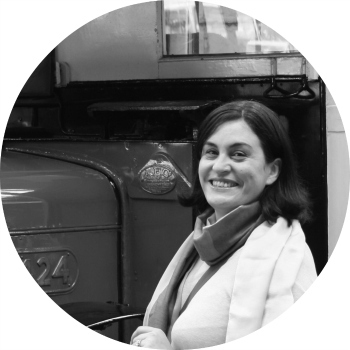 @ JG: it's a pleasure! It was great to learn more about that world. @ Glen:it was a lot of fun and good meeting the street artists too! @ Marion: thank you and thank you! It was great to meet those artists. They've obviously grown up a lot and the younger generation are obviously emerging but it still challenged a lot of my preconceptions. 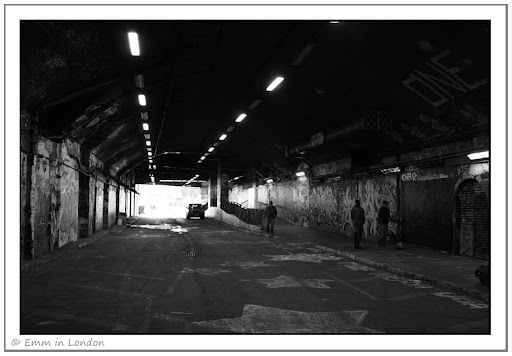 @ William: I have heard of the Old Vic Tunnel events before and will certainly keep my eyes open for future events! @ Rob: agreed. It was a lovely event too. I regret feeling a little under the weather as I didn't make it out to lunch with the others. 2 thumbs up! cool works of street art. wow the ones featuring the cartoon people are amazing! the nearest to that u get by me is ' i was ere' haha! @ Jovir: Thank you! I think so too. @ Tina: Lol! I agree, the characters were great, very detailed. Oh my gosh! I left out some comments when replying! Oops. @ Mujerboricua: Pleasure! Thank you for coming with me! 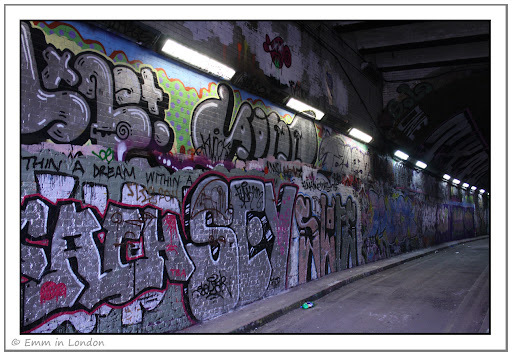 @ Dave: I think that now I have a taste for graffiti, I will be seeking it out whereever I visit in the world. @ Life Rambling: Athens? Well, I didn't expect that! @ Sheila: Thank you. Your comment made me very proud and humbled at the same time. @ Wendy: Ha! He meant that they would physically be there the whole day, as opposed to spraying and dashing!